Joe Magrane could not have been more proud on the afternoon of Nov. 14, 2009, as he stood amidst his fellow Cape Cod Baseball League Hall of Fame inductees listening to his 13-year-old daughter Shannon sing the national anthem. He and everyone else in the sellout crowd in the Monomoy Theater at Chatham Bars Inn knew they were hearing a young lady with an unmistakable talent. Dressed in the same white, baseball-themed suit her mother Renee had worn to the 1987 World Series when Joe pitched for the St. Louis Cardinals, Shannon didn’t miss a note as she handled the difficult song with ease. And the appreciative audience rewarded her with a huge ovation as “… the home of the brave” resounded throughout the hall. Flash forward 26 months to Savannah, Ga., where America’s foremost televised talent search is beginning its 11th season. Full of enthusiasm, Shannon bounds onto the “American Idol” audition stage and flashes a broad smile at judges Steven Tyler, Jennifer Lopez and Randy Jackson. They are all stunned when the attractive young woman before them announces that she is just 15 years old (she has since turned 16). As the questioning continues, Shannon reveals that she is 6 feet tall, wears a size 11 shoe and is a volleyball player whose athletic ability probably can be traced to her dad, a former big league pitcher who is now a baseball analyst for the MLB Network. “We’ve got to meet him,” says one of the judges, prompting Shannon to ask whether she can bring her family into the room, a request that is promptly granted. Soon, dad Joe, mom Renee, sister Sophia and five other friends and family members file into the room and join their favorite singer in front of the three judges and the Fox network cameras. At that point, Shannon’s remarkable talent takes over. The Tampa, Fla., songbird thrills the judges and the national television audience with a superb rendition of the Etta James classic, “Something’s Got a Hold on Me.” Mom Renee silently sings along under her breath as her daughter belts out the song with a bluesy edge and a powerful voice, oblivious to the crowd of admirers around her, the celebrity judges and the millions watching on national TV. To the surprise of no one, the three judges are unanimous in their assessments of Shannon’s performance. Each votes yes, granting her a golden ticket to Hollywood, where her life-changing adventure will continue. Shannon performing in Tampa, including one anthem performance before a Rays playoff game, one of several such appearances at Tropicana Field. It is not the first time in the public’s eye for Joe Magrane’s eldest daughter. As she proved to her Cape Cod audience in November 2009, she has great stage presence, a bubbly personality and a strong voice. 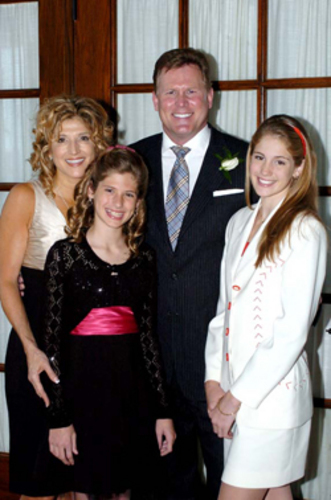 That combination won her local prominence in her hometown of Tampa, where Joe worked as the Rays’ television analyst from the team’s inception in 1998 until 2009 when he joined MLB Network. 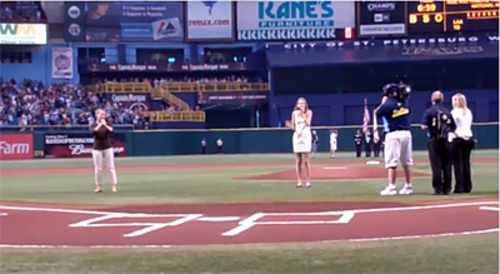 A search on YouTube will yield several clips of Shannon performing in Tampa, including one anthem performance before a Rays’ playoff game, one of several such appearances at Tropicana Field. Shannon attends Tampa’s Blake High, where she uses her 6-foot height as a member of the volleyball team and participates in the arts and drama program. For her part, Shannon recalls the moment when she first discovered she wanted to be a singer. Riding in the family car to a Cardinals game which Joe was scheduled to start, “he’d be listening to his Stevie Ray Vaughan music and I’d be, like, ‘Daddy, turn that off. Let’s listen to Thumbelina’,’’ she says. Joe pitched that day with the Thumbelina tune in his head. Interviewed by an Idol staffer, Shannon says, “It was the best feeling in the world to get that golden ticket.” She lists Carrie Underwood and Jordin Sparks as her favorite “American Idol” winners and she’ll soon get her chance to join them as she continues her journey to stardom in Hollywood.